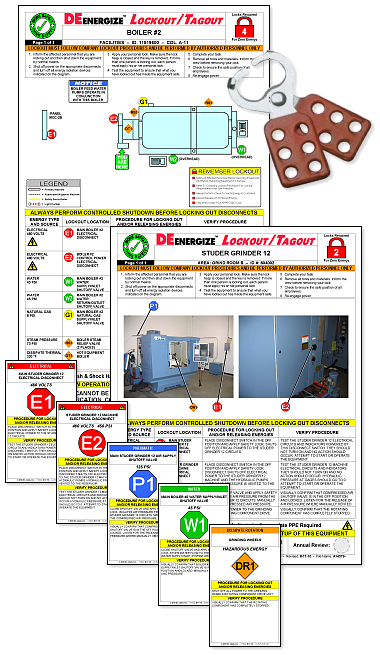 DEenergize Lockout/Tagout placards are equipment-specific Lockout/Tagout Procedures designed to identify all hazardous energies associated with a given instance of production or facilities equipment. Each hazardous energy source, as well as each potentially hazardous stored energy source, is identified in a specific sequence. The sequence is significant in illustrating the relationship between primary, secondary and stored energy sources associated with the equipment. For additional information regarding DEenergize Lockout/Tagout procedures, please visit the Lockout Services page. If you have questions or are in need of assistance, please use the Contact Information page.